It warms our hearts every time Formula DRIFT shuts down the haters. The latest vindication comes from Round 7 at Texas Motor Speedway, the penultimate event of the 2016 season, where the tandem action was so evenly spread, competitors so equally matched, cars so ridiculously close to one another, we wouldn’t blame you if you were watching and literally on the edge of your seat for the entire contest. 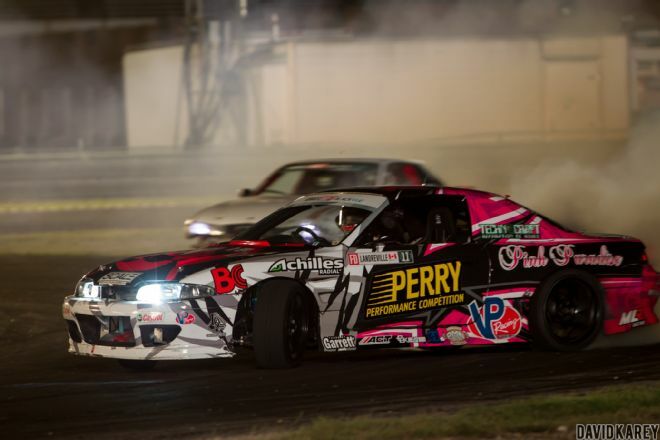 Ok, so yeah, it’s still a drag race – FD cars are powerful and fast, we get it – but with the judges encouraging chase drivers to take the gloves off and be aggressive, we saw a lot of wheelmen take the urging to heart and put the noses of their cars right up in other guys’ business. Texas Motor Speedway hosted Pro2, this was the 3rd round of 4, with the series finals in Phoenix. Marc Landreville had a strong lead coming into Texas, winning 1st last round in Orlando. In 2nd place Jeff Jones was just 5 points away from the champion. Coming into round 7 just 15 points seperated the 3 leaders Chris Forsberg (419), Fredric Aasbo (414), and Vaugh Gittin JR (404). Texas was set up to be a make or break track for many drivers. Most of the field had see battle on this track last year, including Vaughn Gittin who suffered a huge wreck into the wall at outside zone 3. Vaughn talked to us about what it meant to come back to Texas and run the wall again.